DeMarco Murray attempts to escape a tackle during the first half Sunday in Arlington, Texas. DeMarco Murray attempts to escape a tackle during the first half, Sunday, Oct. 5, 2014, in Arlington, Texas. Dallas Cowboys running back DeMarco Murray is kinda killing it this year. Through five games, he’s leading the league in rushing by more than 200 yards1 — and he’s run for 100 or more yards in every game. He’s even getting MVP buzz, and with his help Dallas is 4-1, tied for the best record in football. The outlier running back has a featured role in some fancy new (usually QB-driven) offense. Examples include Edgerrin James and Marshall Faulk with Indianapolis, LaDanian Tomlinson with San Diego or Marshall Faulk with St. Louis. Running data doesn’t always show what it appears to show, and the “eye test” doesn’t help much either. Our meager human eyes can’t really track the multitude of complex variables involved in whether a running play is successful or not. As I wrote last week, whether a team runs the ball is largely a function of whether it’s ahead or behind. A running back’s productivity is even more a function of role, quality of offense, and the situations his team gets into than it is for a QB. This makes it especially hard to judge outliers (and I love outliers). But the Cowboys have been playing competitive games in which Murray has been very consistent, and he has earned his yards in an extremely impressive fashion. Murray has gained an average of 6.4 yards on these runs, compared to a league average of 4.4. His distribution of runs has been great as well. I’ve been critical of running backs (like Peterson) who put up big stats by breaking a lot of long runs but who get stopped too often, making their game like a less-efficient version of the passing game. 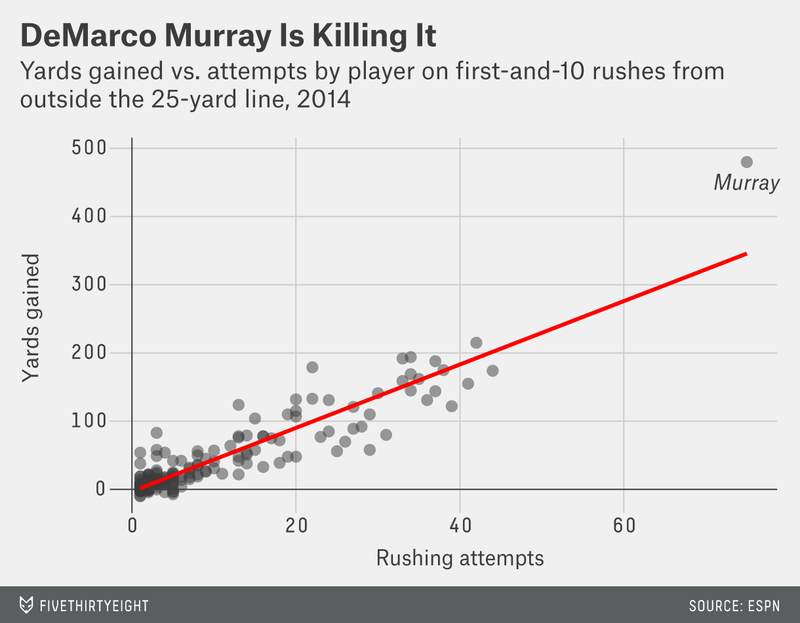 But that’s not the case for Murray, thus far. He is breaking long runs at the same rate as a back like Peterson, yet Murray has only eight runs for no gain or loss of yardage (10.7 percent, or about half of Peterson’s career average of 22.2 percent). Moreover, Murray’s median run has been 5 yards, which compares favorably even to passing in the same situation, with a median distance of 4 yards. Through the first five games, Murray has been the ideal running back: consistently gaining positive yardage, setting up favorable second-down situations (he leads the league in runs of 7 to 9 yards), and still a threat to go the distance. One of my favorite mini-stats from the Murray first-and-10 data is that Murray has five runs this year of exactly4 9 yards, and none of exactly 10 yards. This is smart! Running for 9 yards on first-and-10 outside of 25 yards from the goal is pretty much always better than running for 10. Getting to second-and-short is more valuable than getting a first down because it leads to a flexible situation and forces the defense to prepare for a wider variety of plays. Here’s the easiest way to understand this: A team is trading one down and one yard for the privilege of having only one yard to gain. Since the team will gain that one yard a high percentage of the time, it has a lot of flexibility: It can rush or sneak to try to pick up the first down (and collect bonus yards in the process), or it can launch a deep pass knowing that, barring a sack or a turnover, it will likely still have a short-yardage play on third down. The opponent has to defend everything from short-yardage runs to deep passes at once, meaning it defends each a little worse than usual. The second-and-short scenario is noisier than the others (since first-and-10 is far more common), but the difference is pretty clear. If you compare the horizontal gap between the lines, you can compare scenarios. For example, if a running back has the chance to go down after gaining 9 yards when 53 yards out from goal, he should only take the first down if he can get all the way to the 50-yard line. This difference seems to be tightest at midrange distances (which makes sense because the field is compressed), but it’s generally about 2 to 4 yards. So, if it’s first down and you see a rusher or receiver stretch out for that last yard, boo loudly. Blake Bortles — the only rookie quarterback who saw any action last weekend — was not among the winners. He threw two interceptions in the Jacksonville Jaguars’ competitive loss to the Pittsburgh Steelers on Sunday. Most notably, on second-and-12, down 10-9 in the fourth quarter, the Jaguars’ coaches called a run, but Bortles called an audible for a pass. That pass was picked off and returned for a touchdown, and Jacksonville lost 17-9. It was a run. I just saw guys walk up. It wasn’t a good decision. We could have kept the run on and it wouldn’t have been a bad play. It would have given us a shot and it’s something that I can’t make that mistake again and definitely can’t check out of play into a pick-6. No! Don’t listen to the haters, Blake! Your instinct was right. 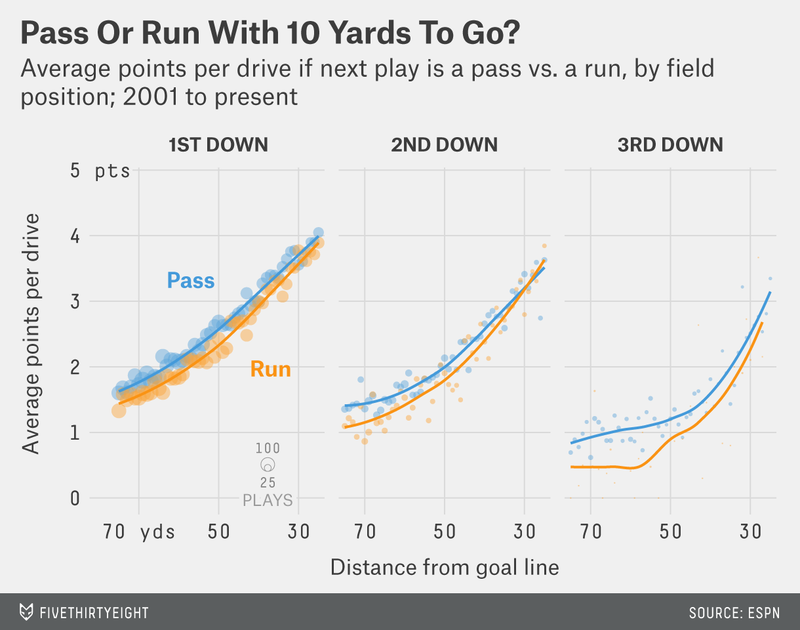 Second-and-12 on your own side of the field is a terrible time to run in general (see our experimental chart of the week, below), and even worse if it’s late in a game you’re losing. Blake, to try to ensure you keep slinging, you get this week’s Gunslinger of the Week award. May it guide you in future games. Last week, I introduced my system for evaluating the most and least valuable kickers. 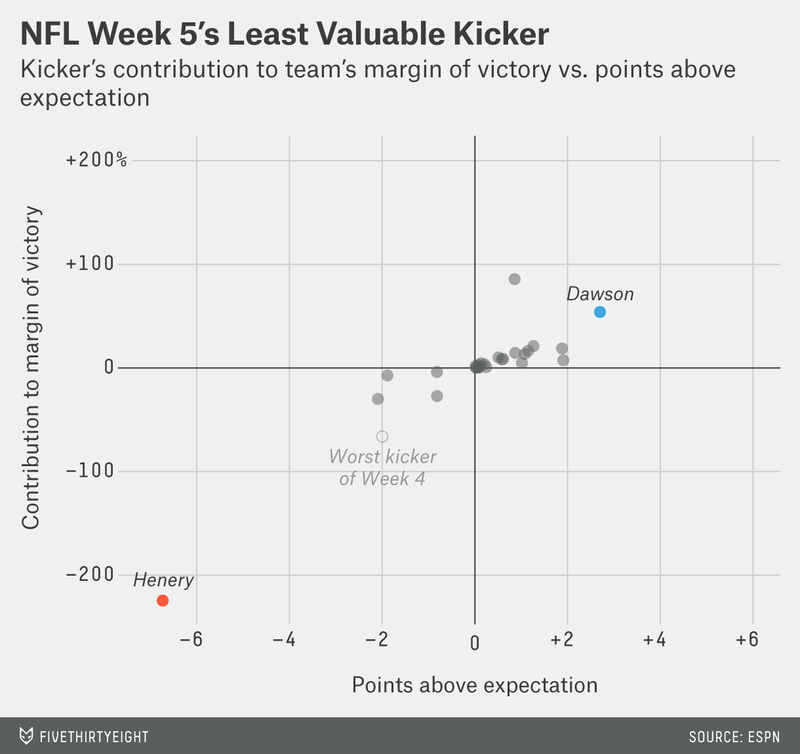 It plots points above and below expectation versus how much the kicker contributed to a game’s scoring margin. To get it out of the way: San Francisco’s Phil Dawson is the MVK for Week 5. He went 5-for-5 including two 50+ yarders in a close win against the Kansas City Chiefs. Bravo! Imagine judging a hitter based on his batting average over a six-game stretch or an NBA player based on his shooting percentage after two games. That’s about what we do when we judge a kicker, who gets 35 chances to test his mettle across an entire 16-game season. But context matters. 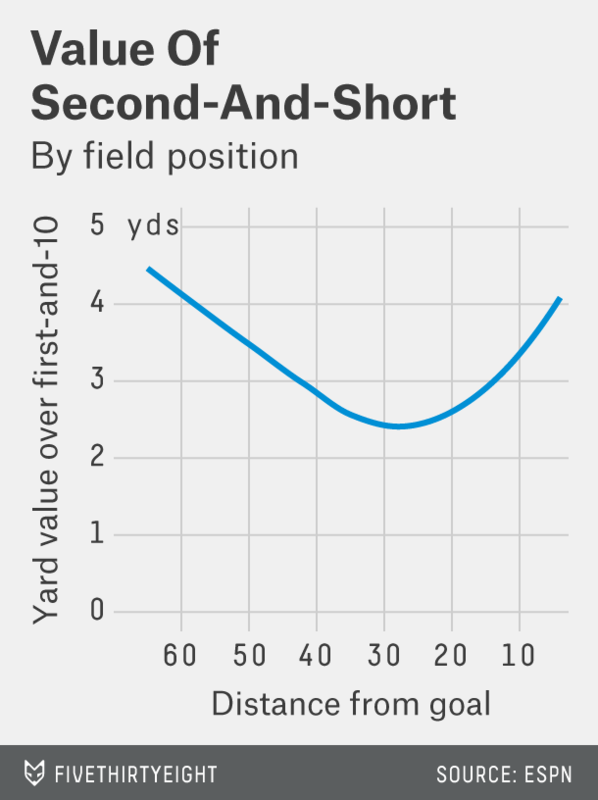 NFL kickers don’t miss from those distances the way they used to.7 Kickers now make roughly two-thirds of their FGs taken from 50+ yards and four-fifths of those taken from 40 to 49 yards. Based on my expected-value model (which adjusts for the year that kicks were taken), Henery’s -6.73 points below expectation in the game amounted to the tenth-worst single day by a kicker since 2001 (a period that includes more than 7,000 kicker games). But Kris Brown, a longtime kicker for Pittsburgh and Houston, had the second-worst day by a kicker for the Steelers in 2001, and then the best day by a kicker for the Texans in 2007. So a kicker can bounce back. Meanwhile, Detroit fell to 4-for-12 on field goals for the season. The entire league has only missed 44 attempts this year. That’s right, Detroit is responsible for nearly 20 percent of all missed field goals in the NFL this season! The single worst team kicking season since 2001 belongs to San Francisco in 2012. The Niners missed 14 field goals and ran 20.6 kicking points below expectation for the whole year. Through five games, the Lions are already running 16.6 kicking points below expectation. But Detroit signed former Bronco Matt Prater to try to dig it out of this hole. Prater had one of the best seasons by a kicker of all time last year, but he has been inconsistent, posting negative value added in four of his seven seasons in the league. If Prater isn’t in good form, Detroit may be the new bad kicking champions. Riffing off the play/drive data I used for the chart of the week, I decided to take a look at whether running or passing is more effective in various situations. This chart uses the same distance and average points as the earlier chart, but it’s split into first, second and third downs with 10 yards to go.8 It then plots the ultimate success of the drive when a pass is attempted versus when a run is attempted in those situations. 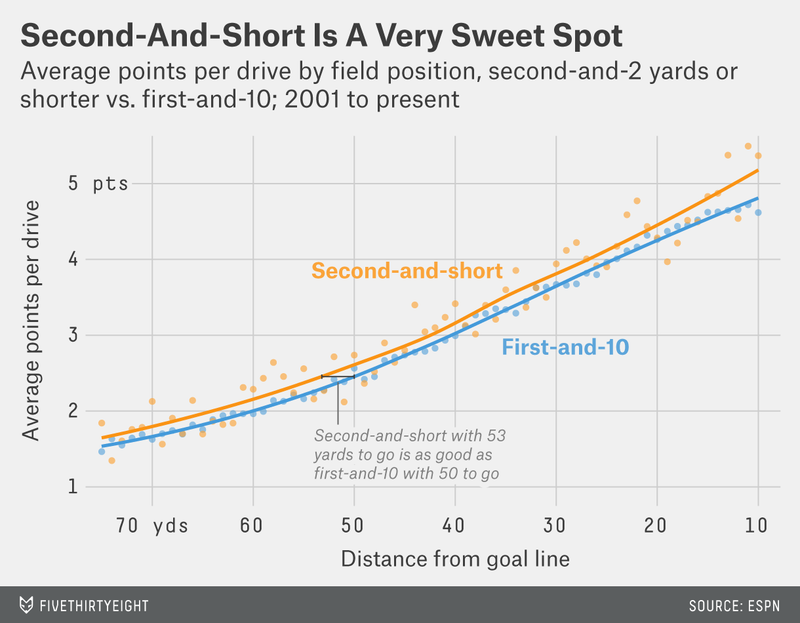 From this, we can see that passing has led to better results in nearly any long-yardage situation. This is a little surprising, especially on first down. Game theoretically, if teams are selecting whether to run or pass optimally, and defending optimally, the value from each should be very similar. It’s possible that, on the margins, running and passing do have the same value,9 but from the bubble sizes, we can see that the pass/run ratio is relatively even on first down, so it seems more likely to me that teams are just running in this spot too much. For short distances, it seems that running — on average — produces slightly better results. I was a little surprised by the second-and-short result, since (as previously discussed) this can be a great down for taking shots downfield. But the difference between the two is small, and the results may also be skewed slightly if teams are more likely to run when their chances of picking up a first down are better (such as in second-and-inches situations). 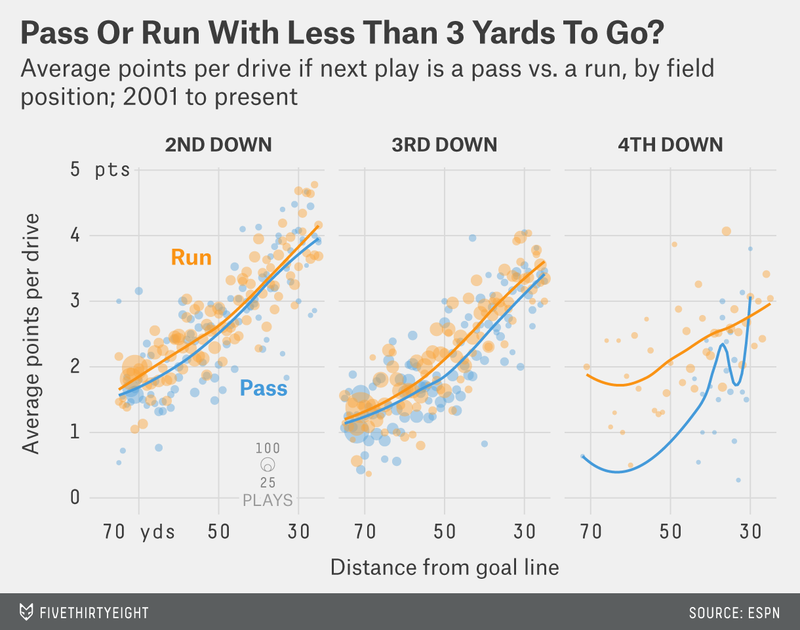 On balance, the charts are fascinating to contemplate, but the takeaway is pretty basic, and so obvious that it’s almost counterintuitive: With long distances to first down passing is generally better, and with short distances running is generally better. When teams do well despite “bad QB play,” it may not actually mean that their QBs are playing badly. Football is a game of limited resources. If a team’s QB is getting the job done, the GM may devote the team’s resources elsewhere. Which brings us to the most empirically significant game of Week 6: the Carolina Panthers vs. the Cincinnati Bengals. QBs like Andy Dalton and Cam Newton have been eclipsed somewhat by young stars like Russell Wilson and Colin Kaepernick, but the Seahawks and 49ers rank third and sixth in non-QB offensive expenditures, respectively. The Panthers and Bengals rank 15th and 23rd, respectively, by that measure. The Bengals have 38 percent of their cap space devoted to non-QB offense — as a share of non-QB salaries, that’s the fourth-lowest in football. Newton has about a $6 million spending advantage over Dalton. Seeing these two solid QBs on teams that don’t spend like crazy on offense go head to head may help us understand how financial considerations affect the game. His 134 yards per game is more than 30 percent higher than second-place Arian Foster’s 101. The year Johnson had 2,000 yards, the Tennessee Titans went 8-8. Of the seven times when a running back broke 2,000 yards in a season, only one player — Terrell Davis for John Elway’s Denver Broncos in 1998 — did so on a team that won more than 10 games (or even made it out of the first round of the playoffs). Of course, to be even more accurate, it can help to do a situation-for-situation comparison, like I did for Jamaal Charles and Peterson in my NFC West preview. Inasmuch as these things are exact. Don’t worry, you don’t need to pray to the Hacker Gods. You need to pray that the Hacker Gods exist. In Week 2, only one QB won with any interceptions. This past week, Drew Brees had three interceptions, including a pick-6 with his team trailing — the coup de grace of the gunslinger — and his team still pulled off the win! The expected value of kicks on that scale is calculated based on a probit regression over every kick since 2001 that includes the year that the kick was taken as a variable. Going for it on fourth-and-10 is too rare to be meaningful. In which case, it would be similar to what I’ve said about NBA 3-point attempts. Technically, I’m using “and-1” and “and-2” distances, which includes all distances between 0 and 2 yards, and possibly some distances between 2 yards and 3 yards, as discussed in last week’s column. Or special teams, or coach, or anything — and this applies to resources other than money, but money is the easiest to examine. Technically, the Eagles’ highest-paid QB is Mark Sanchez. Idea for future article: quarterback ratings adjusted for the salary of the rest of the offense!